Location, natural resources. Population. 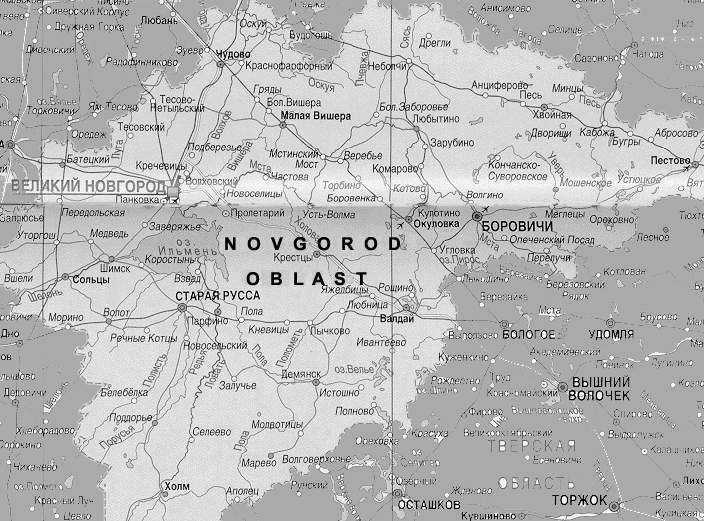 Novgorod Oblast (territory - 55300 sq.km) shares an administrative border with Leningrad Oblast, Pskov Oblast, Tver Oblast, Vologod Oblast. The majority of the territory occupies lowland areas. 1800 lakes are located within Novgorod Oblast. The largest of them are Ilmen and Valday. Natural resources. Novgorod Oblast has sufficient deposits of clay, lime, sand and gravel material, timber, peat, as well as rich water and fish resources. More than a half of the region's territory is covered with woods with prevailing deciduous species of trees. Transport. Novgorod Oblast has an extremely favourable geographical location on all major transportation throughways. Auto-mobile, air, water and rail highways connecting St.Petersburg and Moscow cross through its territory. The main medium of transportation through Novgorod Oblast is automobile, carrying the majority of cargo and passengers. The Scandinavia - Centre Automobile Highway, Moscow-St.Petersburg Highway go through the region's territory. The annual cargo turnover of the six largest motor carriers is over 110 thousand tons. Main cargo destinations are Finland, Germany, Sweden. Density of hard covered road network - 153 km of roadway for every 1000 sq.km. Extent of hard covered roads - 9.6 th.km, domestic navigable ways - 627 km, railroads - 1.2 th.km. The railroads crossing Novgorod Oblast link it with other regions domestically, as well as with the CIS, Baltic, European and Scandinavian countries. Administrative - territorial division. Authority. Novgorod Oblast consists of 21 districts, 10 towns, 22 settlements of town type and 3843 settlements. The Duma is a standing legislative authority of Novgorod Oblast. The regional administration is headed by the governor of Novgorod Oblast. The governor has one deputy. Government of the Novgorod area includes 14 committees, which chiefs are in subordination for the governor. Economy. GRP in Novgorod Oblast in 1998 - R 9401.8 mln (USD 454.2 mln), that amounts to 0.4% of GRP for Russian Federation (3.8% of GRP for Nord-West of Russia). GRP per capital in Leningrad Oblast in 1998 - R 12758.6 (USD 616.4). Industry. Share of industry amounts to 37% of GRP of Novgorod Oblast. The main industry sectors of Novgorod Oblast are chemical industry, forestry, wood-processing, pulp and paper production, radio-electronics, machine-building, metal manufacturing and production of refractory materials. Industry centres are concentrated in Veliky Novgorod, Borovitchy, Staray Russa, Chudovo. Index of industry output in 1999 in Novgorod Oblast - 115% of 1998 level, in 2000 - 105.5% of 1999 level. Agriculture. In 2000, total gross production volume in the agricultural sector of Novgorod Oblast amounted to R 4309 mln (7,2 increase over 1999). Main branches are dairy live-stock husbandry and pig-breeding; growing of cereals, industrial and forage crops, potatoes and vegetables. Investment Activities & Investment Legislation. In 2000, total volume of investments in a fixed capital in Novgorod Oblast was R 5200 mln (90% to 1999 level). The regional Law "On Tax Benefits for Companies and Organizations Located in Novgorod Oblast" has been in effect since December, 1994. According to the Law, companies with foreign invested capital engaged in production and registered on the territory of the oblast are exempt from all taxes paid to the oblast budget for the whole pay-back period. Besides, regardless of the share of foreign invested capital, companies are relieved of part of the local road levies. Many districts and cities of the region also offer foreign investors additional tax breaks on local taxes. Enterprises that invest their own or borrowed funds in the projects in Novgorod Oblast are exempt from up to 57% of taxes and thus have more tax breaks, than even in Kalinigrad Oblast ("Yantar" Free Economic Zone). Since January 1, 1997, four districts in Novgorod Oblast (Batetsky, Volot, Marevo, Poddorie) are zones of most favoured treatment. In these zones, commercial entities, excluding trade companies, are exempted from: a) taxes to the regional and local budget: profit tax, property tax, levy for educational needs, fee for the use of interior of Earth, fees for mineral and raw materials replenishment, forest tax, water fee, land tax; b) company profit tax paid to the federal budget is refunded from the region budget. In 1998, the "Law on Investment in Novgorod Oblast" summarising the "rules of the game" for foreign investors, was adopted. Novgorod's legislative and executive authorities guarantee investors, that the legal terms for their companies on the regional level will not become less favourable, than at the time the investment decision was made. This 'sunset clause' has been enacted in legislation. Rapid growth of foreign investment (from USD 153 mln. in 1994 to USD 625.4 mln. in 1999) was the result of a favourable environment and flexible investment legislation. Novgorod Oblast has registered about 200 enterprises with foreign invested capital. The largest investment has come from the EU countries, including Cadbury-Schweppes (UK), Dansk Tyggegummi Fabrik (Denmark), Kymene, Schauman Wood, Raute, Thomesto (Finland), Pfleiderer, Sommer GmBH & Co (Germany), Holzindustrie Preding (Austria), Igienica SA (France), Mo Do Skog (Sweden) and Dresser (US). Most of the foreign capital is invested into industrial sector (food industry, chemical industry, logging & woodworking industry). Novgorod Oblast has the largest per capita volume of foreign investment in Northwest of Russia.